The present Church of All Saints is part of a long history, and is probably the fourth church that has stood in the community of Annesley. There was most likely a Saxon foundation, which was replaced by a Norman church in the 12th Century. This was itself replaced in the 14th Century with a church, now Annesley Old Church, built near to Annesley Hall (rather outside the current village). The ruins of the Old Church still stand. The current Victorian Gothic church was built following the sinking and development of Annesley Colliery, which began in 1865 and led to the establishment of a new centre of local population (New Annesley) about a mile and a half to the east of the 1356 Church. The newcomers soon complained about the distance they had to walk to get to church and in response the then Vicar, the Revd Clement Howard Prance, together with the Squire, John Chaworth-Musters and his wife Caroline, resolved to build a new church. The land was given by the squire and the architect was Mr JG Jackson of Oxford, a friend of the Revd Mr Prance. The church cost £8350 to build and equip and this sum was funded by the Squire, the Vicar, the Vicar’s brother, the Vicar’s friends, colliery customers, local contributions, concerts and sundry collections. In addition, the Squire paid for the hanging of the bells, five of which were transferred from the old church, while a sixth was added later. While building was underway, moves were made to establish a bridgehead of worship in the colliery community and on 7th January 1873 a licence was granted by the Bishop of Lincoln to “hold, conduct and celebrate Divine Service” in a building referred to in the Diocesan document as the Mission Room. This was a large wooden hut, situated at the back of 15 and 16 Byron Road, which local people called, rather more prosaically, the Mission Shed. The New Church was consecrated in 1874, when the hut was sold to the East Kirkby Methodist Church. Later it passed to the Mansfield Primitive Methodists. The new church is of very fine proportions. It consists of chancel, nave, aisles and tower, and is a fine specimen of the pointed style of architecture, built of stone procured from the quarries of Sutton and Annesley, and dressings of Ancaster stone. The roof is of Brosely tile. The tower, which is of considerable height, is a well-proportioned and elegant structure, in which is placed a peal of six bells, removed from the old church near the Hall. Both externally and internally the edifice presents an elegant and imposing appearance. For many years after the New Church opened, the Old Church continued in use. All the children of John and Caroline Chaworth-Musters were baptised there. The Annesley Parish Magazine for 1884 had a front cover featuring sketches of the Old and the New Churches on alternate issues. Harvest Festival Services continued to be held in the old church in the Park, rather than in the new church in the colliery village. On 7th January 1907 the New Church was badly damaged by fire which destroyed the roof, bells, interior fittings and organ. At a cost of some £4750, the church was restored, overwhelmingly to the original design but with minor changes to the interior. The architects were Evans and Son of Nottingham and the main contractor was Thomas Fish and Sons. Messrs Evans, however, advised that the tower could not support traditional bells and therefore a set of tubular bells was installed. 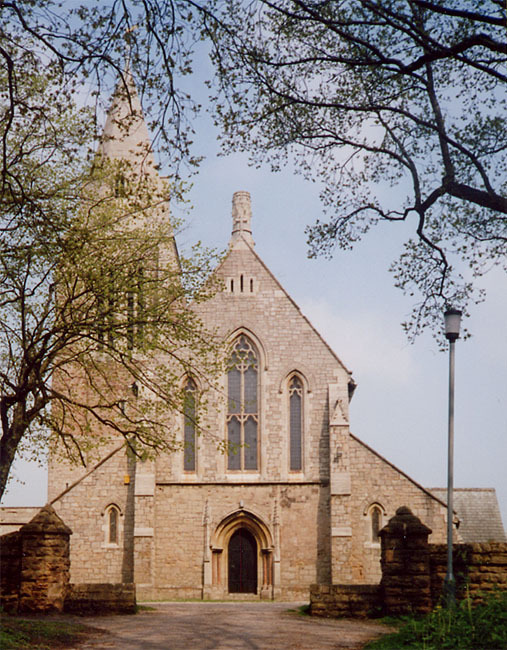 The New Church was reopened on 20th February 1909. In 1963, the Parishes of Annesley and Newstead were united, with subsequent incumbents responsible for Annesley, All Saints; Newstead Village, St Mary the Virgin; and Newstead Abbey, St Mary.